4 #2. Creating Unique Content and a lot of it! 6 #4. Posting Relevant Info that is Interesting and OFTEN!! Do you know how to make Google happy and get a website to the first page in search engine rankings? There is no doubt that almost everyone of us wants to be number one. Being number one means you are greatest and that you beat the rest of your rivals. There is nothing wrong with being number two, but most people see second places as losers. The same goes for third places, and so on and so forth. According to Vince Lombardi, an American Football player, coach, and executive, ” Winning is not a sometime thing; it’s an all time thing. You do not win once in awhile, you do not do things right once in awhile, you do them right all the time. Winning is a habit. Unfortunately, so is losing.” The same goes for your website’s search engine ranking. 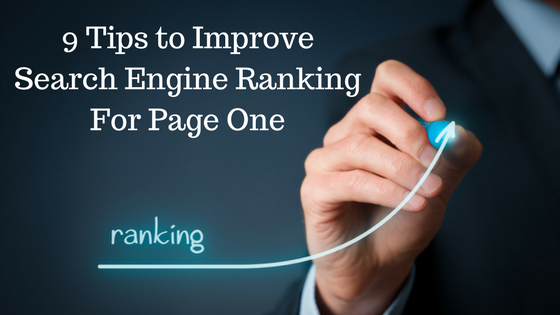 Being on the top of the ranking requires doing the right thing over and over again. If you want your site to rank high in search engines, you need to come up and implement the right recipe for success: quality backlinks, social interaction and superb content. Putting your website on the top of search engine ranking may seem overwhelming for some. Just imagine, you have thousands, if not millions of other competitors who are also seeking the top spot in search engine ranking. The road up can be quite challenging, especially if your website is new. This is where some important search engine ranking tips comes into the picture. Long tail keywords are queries that are more specific (and usually longer) than more conventional “head” keywords. Why Long Tail Keywords you ask? Long tail keywords get less search traffic, but will usually have a higher conversion value, as they focus on a more specific product. There are so many Keyword Tools out there, we don’t need to get into those as that is another course on its own. But just starting out with the Google Keyword Tool is fine. I mean, they are the ones we are going after so let’s use the tool they give us for our use. Look for phrases that get a minimum of 400-500 searches/month. #2. Creating Unique Content and a lot of it! How do you get unique content? Well, do you like to do research and write? I hope so because that is the best unique content out there. YOUR OWN WORDS! I know, you are cringing like me. There are alternatives, though, ghost writers and PLR if you can find appropriate content then rewrite the content slightly to fool the Google algorithms. The ‘$5 dollar site’ and scores of other similar sites are a good option but you need to make sure you are getting unique content and you may need to re-write it if their command of the English language is not quite perfect. Simply put, a picture or picture with words and even text overlay to make a point or explain the pictures. Pictures are visual and so many people are visual in this BIG world. Pictures help, big time! #4. Posting Relevant Info that is Interesting and OFTEN!! Google like to see fresh content. No, not Fresh Prince of Bel-Air. Articles that are relevant to your keywords with fresh or new content. Stuff Google has not seen before and it has to be good and between 1500-2000 words per post. There are many posting software out there to help with that but they can be expensive. No worries, you can post it yourself. Yep, Local Search is very popular and easy to Google now. They want to give us, the neighborhoods we live in local information. Local beats out the national and international pages, 10 to 1! Go after the towns surrounding you first for whatever site you are trying to rank. Then, go after other areas once you are good at it! How do you get your website ‘Found’ or indexed by Google? Get the site indexed and that’ll boost your rankings. But, first, they have to notice you and then ‘crawl’ your site to look at your content. If they don’t like what you have, BAM no page 1. There are sites out there that will analyze your site but the work is already done and you have to start over from scratch to try and rank. A slow website is not only bad for the user, but also for search engine optimization that Google uses to rank your site. Thus, a slow website can cause your site to rank lower in the search engine results. That translates to fewer page views and less ad revenue or customer conversions for you, depending on how you are using your site. Go for VPS hosting or ‘cloud hosting’ as it is much faster. Also, make sure the site looks good on your phone and tablet. There are sites out there to review your website and warn you if it is not mobile-friendly. You definitely want all users to have the best experience. Sound easy? Well, it is but just does it and make sure you use the keywords often and properly. Don’t put the word in with no context or reason. The Google machine can see this and will penalize your ranking. Use internal linking on the site to keep visitors on your site with similar and relevant info to keep them interested. If you jump around too much and lose their attention, you risk losing them to other sites and Google sees how long a user stays on your site. The Longer we stay on a site = Google thinks the site is better quality and sends more organic search traffic. WIN-WIN!! From this article, you may assume that ranking on the search engine is definitely not a rocket science, people. You can do a lot of things to rank your website. You only need to learn how to be creative and patient in implementing those techniques and strategies. It may take you a month before you finally find yourself ranking on the page one of SERP’s. Just do not give up because you are on your way to the top.